Register your service dog and therapy dog. Your therapy dog, service dog will be placed in a database for you to retrieve from your smartphone, tablet, or laptop. If you prefer, you may order a card from us and we will deliver it to you via mail. If your order is time sensitive, we have expedited digital and physical delivery options available. Please provide the Therapy dog’s name, the name of the handler, address and a photo of the therapy dog (note: the information entered below must be exactly as you want them to appear on the ID card). I do not wish to add a photo and understand a photo will not be included on my card. All Certified Therapy Dogs with a Therapy Dog Certifications License will be registered into the supportdogcertification.org database. According to the Americans with Disabilities Act (ADA), a service animal must be individually trained to do work or perform tasks of benefit to a disabled individual in order to be legally elevated from pet status to service animal status. It is the specially trained tasks or work performed on command or cue that legally exempts a therapy dog [service animal] and his disabled handler from the “No Pets Allowed” policies of stores, restaurants, hotels and other places of public accommodation under the ADA. 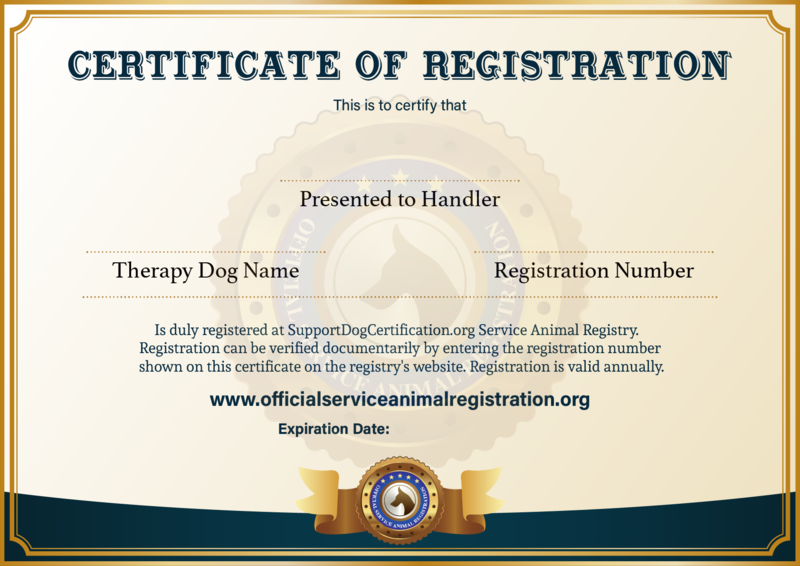 Display your Certified Therapy Dog license on your Therapy Dog’s vest or on your phone. 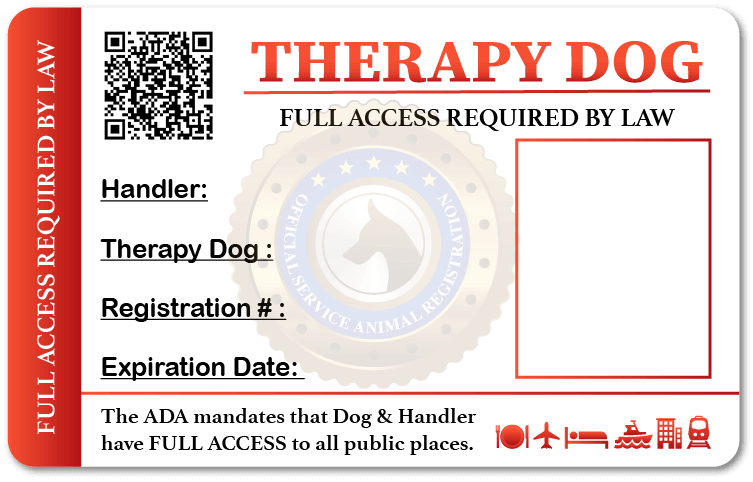 Keep your Therapy Dog Certification on you at all times and when traveling with your Therapy dog.